Here and is a gamma random variable with shape parameter and scale parameter . The mean and variance of are and . So variance stabilization theory suggests that the logarithmic transformation should be used. This Demonstration shows that the value of that works best for making the distribution of symmetric depends on the shape . The case of with shown in the thumbnail works fairly well. With , try experimenting with other shape parameters to see how well this transformation preserves symmetry. 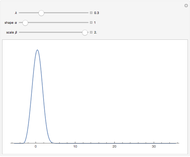 Compare how well the logarithmic transformation, , works to make the distribution symmetric. 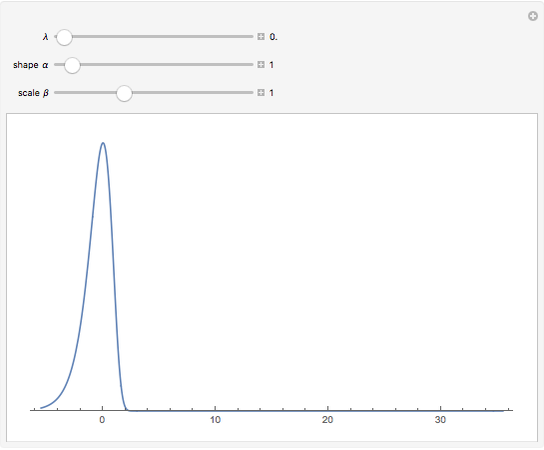 With fixed, explore the shapes of various gamma distributions. Note that as increases, the gamma distribution approximates the normal distribution. Changing the scale parameter enlarges or shrinks the distribution but has no effect on the skewness or lack of symmetry. Snapshot 1: The scale parameter has been increased from in the thumbnail to . There no change in the symmetry. 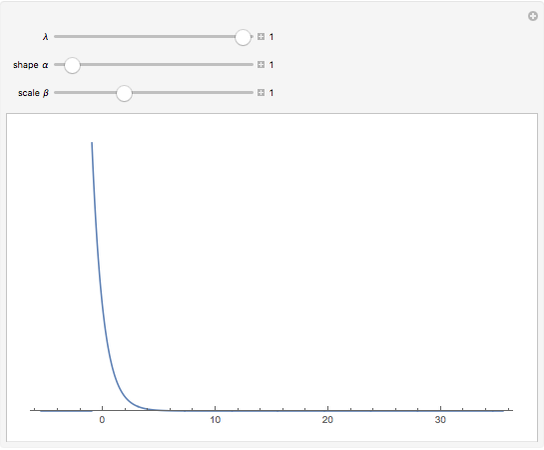 Snapshot 2: Here , so this corresponds to the standard unit exponential distribution. Because of the Box–Cox transformation with , the location has been shifted to the left by 1, so the mean of the resulting distribution is now 0, while the variance remains at 1. The built-in Mathematica function FindRoot found that for . 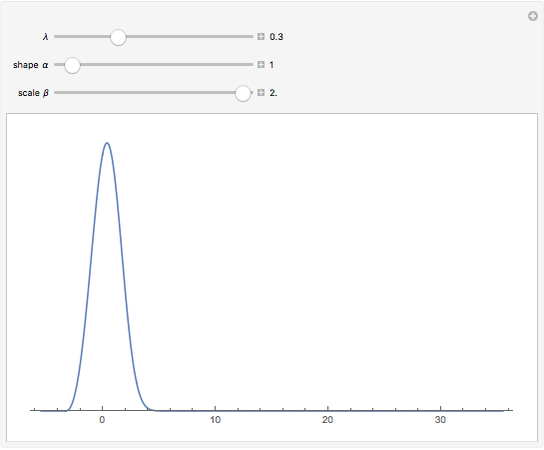 Snapshot 4: When the shape parameter increases, the gamma distribution approximates the normal. Here and corresponds to no transformation, apart from a shift in location, and even with , the gamma distribution is close to the normal distribution. 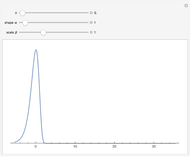 The degree of approximation could be visualized using normal quantile or probability plots. You may be interested in extending this Demonstration to include the use of these plots for choosing a suitable transformation. The theory of variance-stabilizing transformations was derived in . For more details and examples with transformation to symmetry of random variables, see . M. S. Bartlett, "The Use of Transformations," Biometrics, 3(1), 1947 pp. 37–52. I. McLeod. 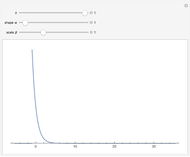 "Symmetrizing Positive Random Variables" from the Wolfram Demonstrations Project—A Wolfram Web Resource. demonstrations.wolfram.com/SymmetrizingPositiveRandomVariables. Ian McLeod and Nagham Muslim Mohammad "Transformation to Symmetry of Gamma Random Variables"